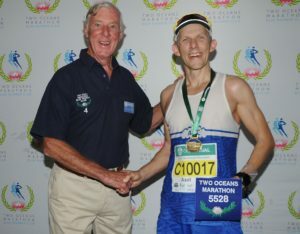 Finally it was here: Race day of my 10th Two Oceans Ultra marathon. 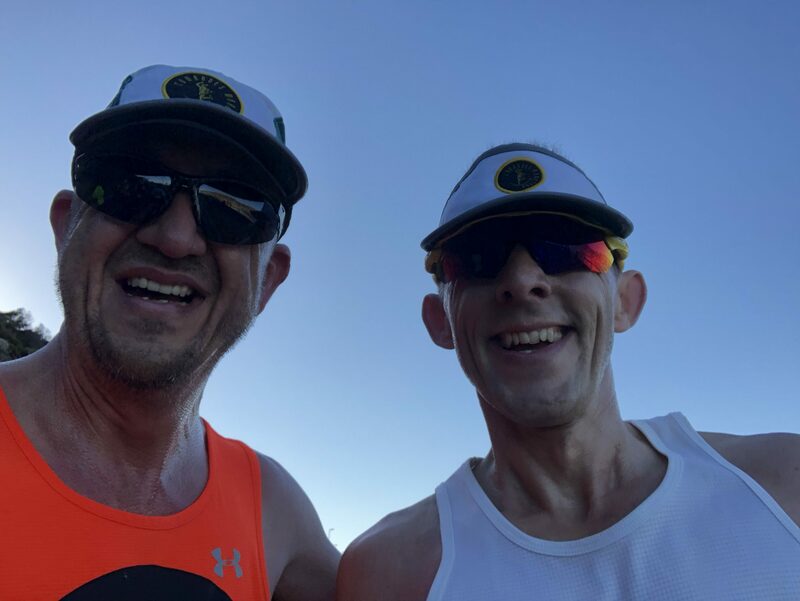 Getting to the start has become a standard procedure in the meantime: Alarm goes at 3:15 am, having breakfast (2 slices of banana bread, 1 with almond butter, 1 with honey, overnight soaked chia seeds, a bulletproof coffee ), leaving the house at 4:30am. 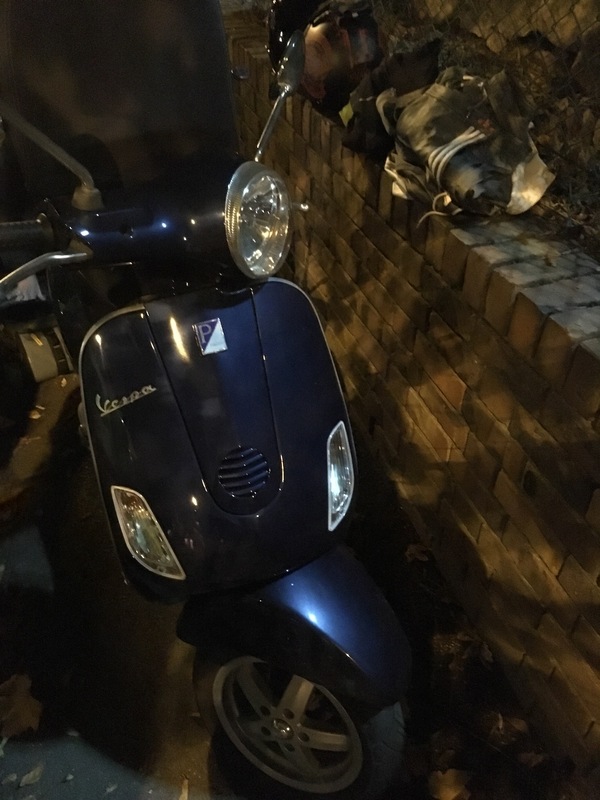 We are lucky to own a Vespa scooter. This way we can easily go past any traffic jam on the way to the start and find parking very close to the start line. 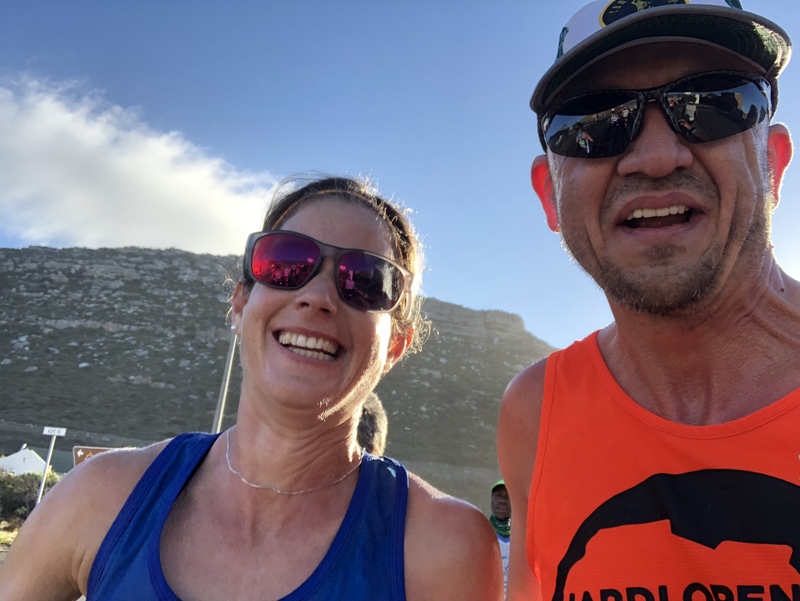 My wife, lining up for her 9th Two Oceans Half Marathon and I, still had plenty of time to get to the start line, drop off our bags at the well organised DHL trucks and wish each other luck for our races. My main goal was to have an enjoyable race going for my blue number. If you are not familiar with the Two Oceans race: After 10 successful races you become a member of the blue number club and receive your personal, lifetime number. From that day on you are always going to run with the same number printed on a blue background. I never would have thought I would get to that point when I came across the Two Oceans marathon 12 years ago. You can read more about my journey in my post “from occasional jogger to blue number“. Based on my training I had clocked about 100 km less than what I should have to be confident in finishing in less than 5 hours, and I missed some solid speed sessions on the way. From the 1st of November 2017 until race day, I clocked 1147 km, while in the years of of my sub 5 finishes it was 1431 km and 1210 km respectively. Anyway, I felt really good and knew I’d be on the edge of making the sub 5 or not. My strategy therefore was to start the race and run the first half based on my sub 5h strategy while monitoring my heart rate very carefully. As an avid reader of my blog you know how disciplined I can be. 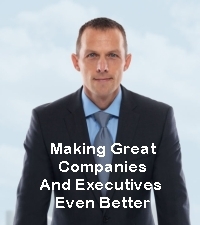 And I would have followed my strategy if…. I observed her run/walk strategy, where she walked when she took some water from the water table and started running again shortly after. It was such a unique experience, I wanted to enjoy that moment for longer. And so I looked at my heart rate and it was about 5 beats higher as it should have been. I knew, I really knew, that I would have to pay a price for that later. But it didn’t matter. So for more than an hour I had the pleasure of running with the champ. Until half time I was in line with my strategy if you look at the pace and time. And I did not yet feel the impact of the higher heart rate. 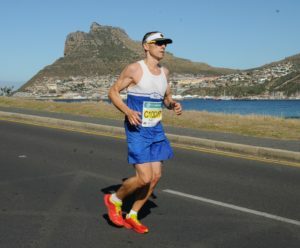 Going up Chapmans Peak went really well, maintaining a solid pace of 5:20 – 6:00 min/km uphill. But getting to the top was more difficult than it should have been and I took a longer walk break (6:55 min/km). The downhill after Chapmans Peak is always difficult. You have to run fast, but not too fast, after reaching the top (35 km total distance). This year it was even harder. We had extreme head wind! I had to push really hard downhill to get to a speed of 5:15 min/km. Usually I would run the 4 km downhill stretch at a 4:50 min/km pace without pushing hard. I slowly felt that not only the wind, but also the ‘a little bit too fast’ run with Caroline started to have an impact. Now I had to pay the price. And it didn’t matter. 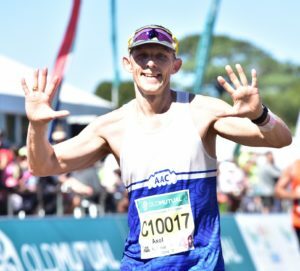 Yes, I would have loved to finish my 10th Two Oceans with a sub 5 h finish. But what’s the difference if I make it or I don’t? I learned over the years, and have written about it many times, that the finish time is not really relevant. 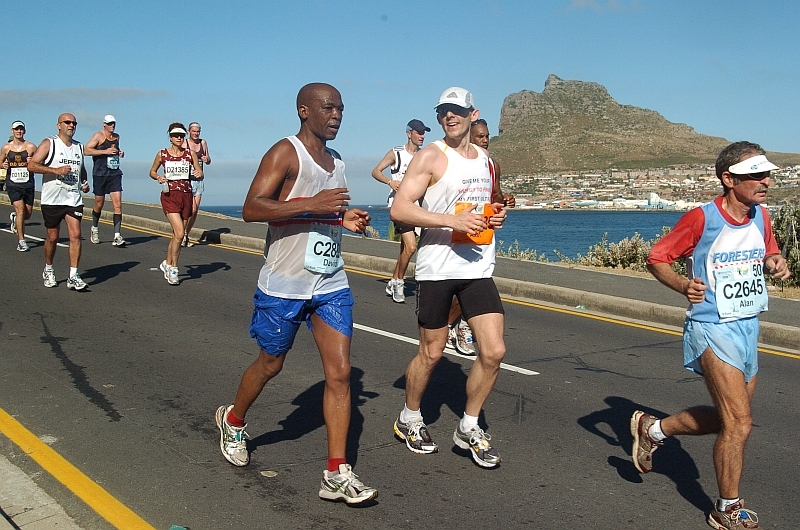 Yes, I do have goals, and I want to improve my marathon PB later this year. 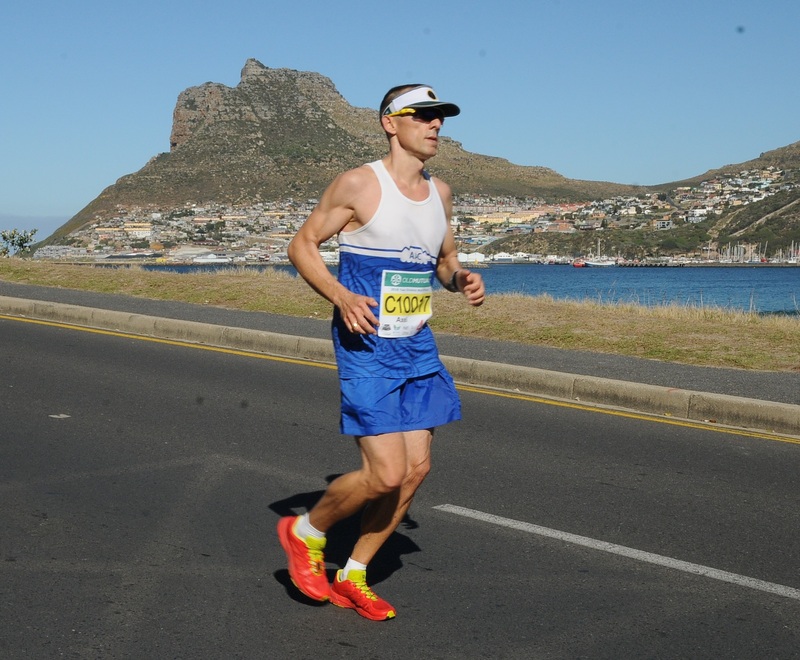 But for Two Oceans I knew my preparation was good, but not perfect for a sub 5. 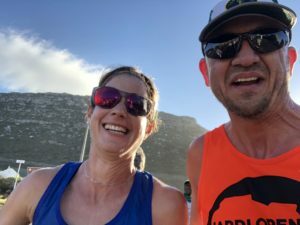 After getting into Hout Bay I realised, it doesn’t make sense to push for the sub 5. I was about 5 minutes behind schedule. And I decided to take it easier from now on. I started walking every now and then and enjoy my “blue number”-run. It was a good decision. 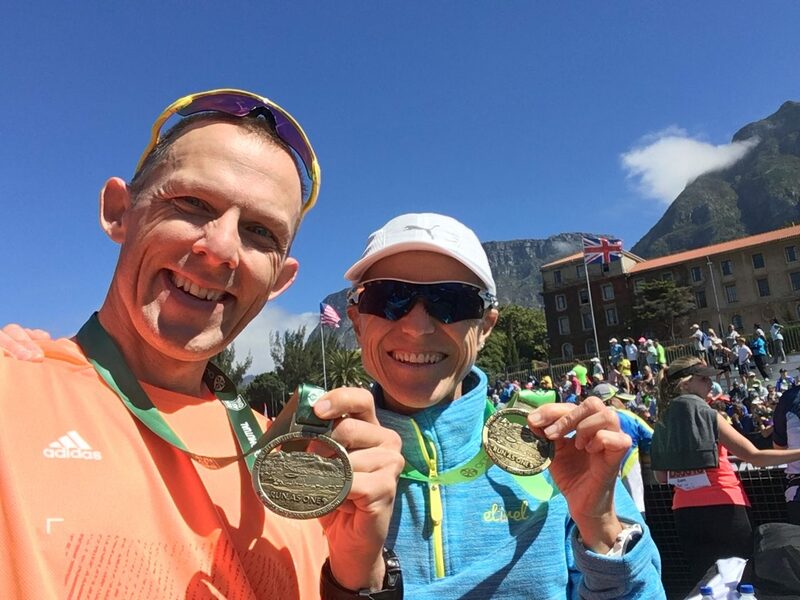 My marathon time was about 3h 47 min and I took more walking breaks on my way to Constantia Nek. My nutrition this year was almost the same like in the past: Home made date balls, some pizza, 1 or 2 potatoes from the water tables. 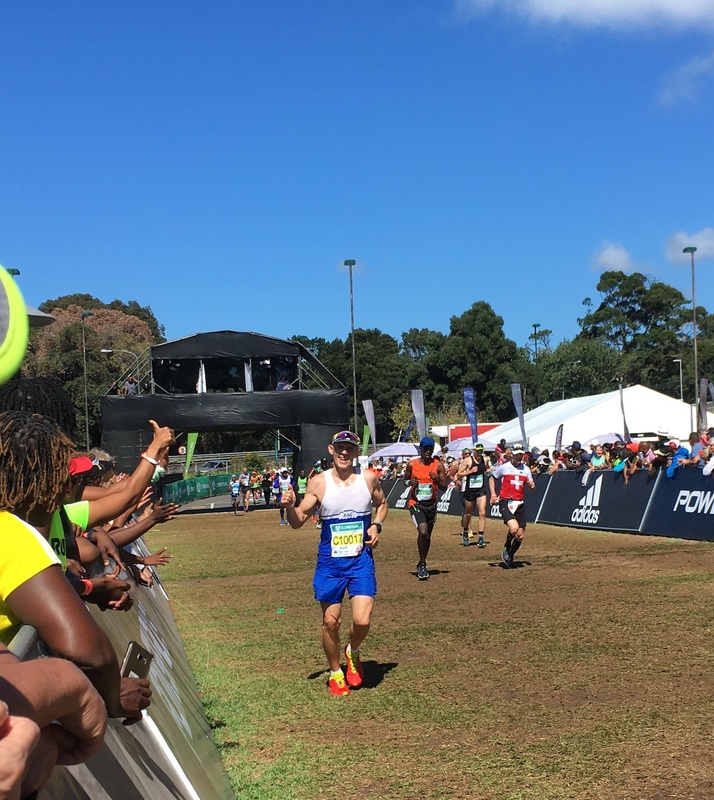 For the final 10 km from Constantia Nek I had a big smile on my face. I knew I made the difficult parts and, for the first time in many years, I did no suffer from any cramps, especially not in my right thigh. This is the result of a fantastic strength training I started in December 2017 with Ronel Nattrass. I walked and ran and had fun. I was soooooo much looking forward to my blue number. And then I got to the finish. I saw several friends and my wife at the finish stretch. What a wonderful feeling! Eventually I finished in 5h 13 min. After receiving my number I was guided to a special section of the finish tent. I met club mate Mark Wagenheim, who received his quadruple blue number (yes, 40 finishes). I’m really happy. And the German flag at my head is really a coincidence! 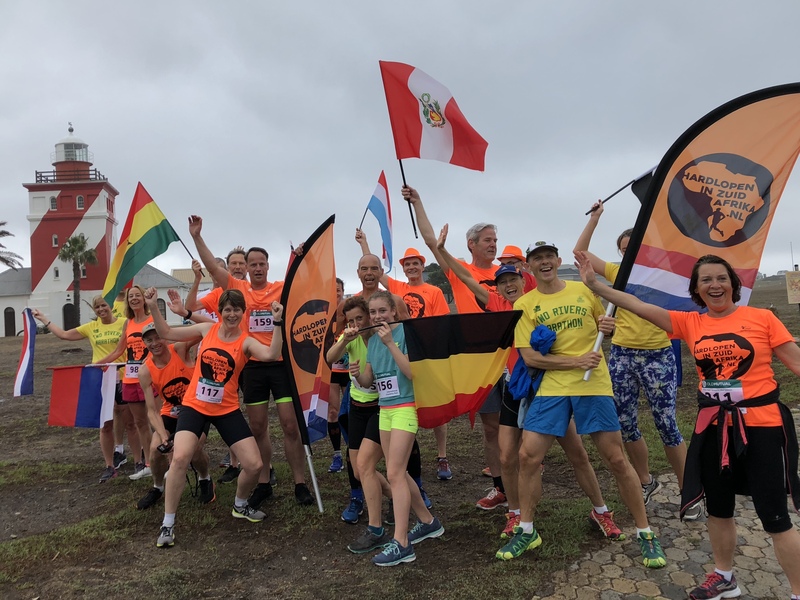 By the way… of course there was a prelude to the race – the International Friendship Run on Friday. Always so much fun to do a short 5 km stroll around the V&A Waterfront. 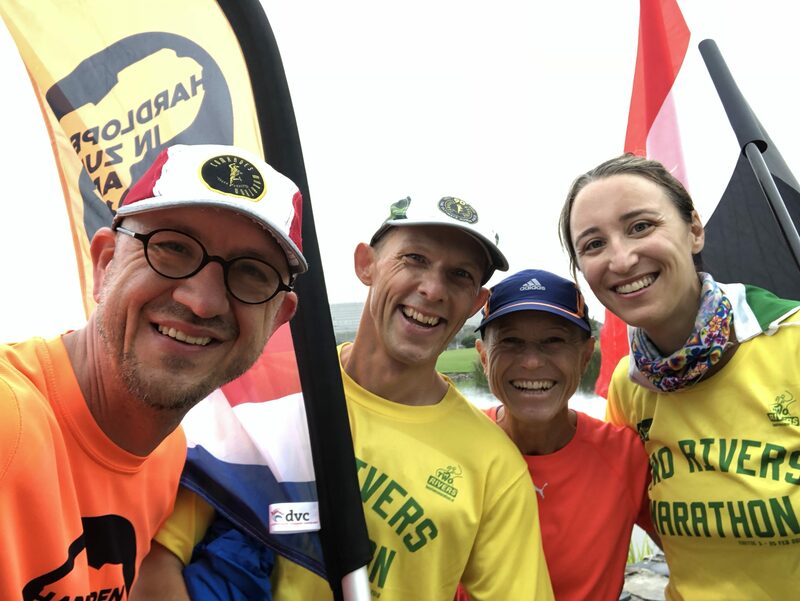 What I like the most is meeting friends from around the world I know from previous races and to bump into blog readers. This year I got to know André and Marina with her daughter. 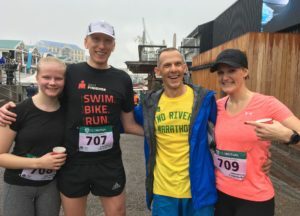 He contacted me in 2017 and this year he could attend the race doing the Ultra, while Marina did the half. It was a huge pleasure meeting you and it gives me such a boost of motivation to carry on writing this blog! Unfortunately I have to express my rising dissatisfaction with the Two Oceans Organisation and their increasing lack of professionalism. This year they introduced a new registration process, where the race numbers only get printed when you stand in front of the registration desk. When my wife and I got to the expo and registration, there was already a long queue, which we were able to bypass due to how we registered. When we got into the registration area inside the building it was very quiet. Which means, that they simply did not let enough people into the building. 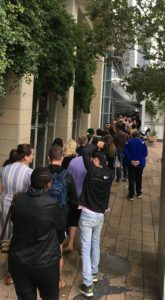 My wife and I registered and both had to wait for 2-3 minutes until our numbers were printed. You could already imagine what would happen when the masses would get here on Friday and Saturday! The goody back we received together with the number is a joke: Filled with a few trial packs of junk/artificial food and lots of flyers. I rather don’t get anything than a bag filled with stuff I will discard immediately into a bin. Sorry. On Friday the system collapsed and people had to wait for a long time in queues outside the building, and Saturday was the worst, where runners – supposed to be running the very next 21.1 or 56 km respectively, had to wait for more than 3 hours because they simply did not get the numbers printed and the documents handed out. 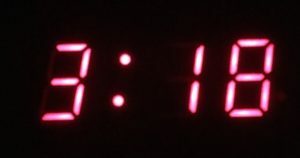 The registration took until late in the evening. Really late! This is an absolute shame for a race turning 50 years old next year. 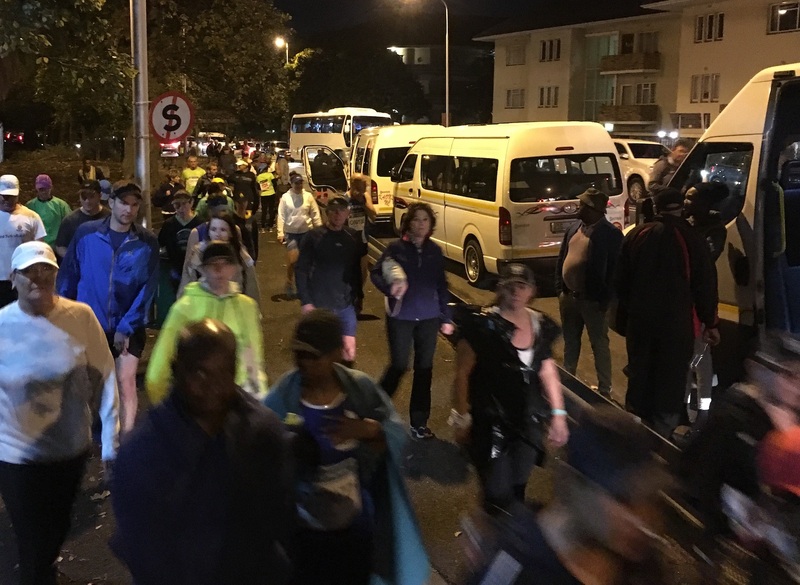 I never experienced anything like that at Comrades or any other huge event. 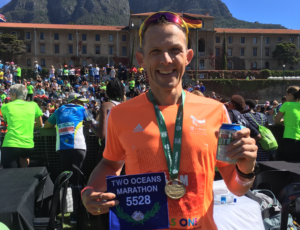 It’s so sad to get the feeling that the Two Oceans organisation seems to care more about how to make money than to cater for their clients – the runners. I couldn’t do what I am doing without the support and understanding of my wonderful wife Silke. 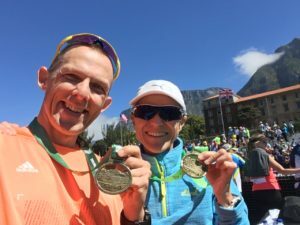 She received her 9th Two Oceans Half Marathon medal this year. My wife Silke and I, she finished her 9th Half marathon today! I also want to thank my strength coach Ronel Nattrass. I’m working with her since December 2017 and it already makes a huge difference. I feel stronger than ever before and the two weekly strength sessions will eventually make me faster. I wasted many years at the gym doing exercises not really helping me in my running. Now the time spend at the gym is worth every minute! 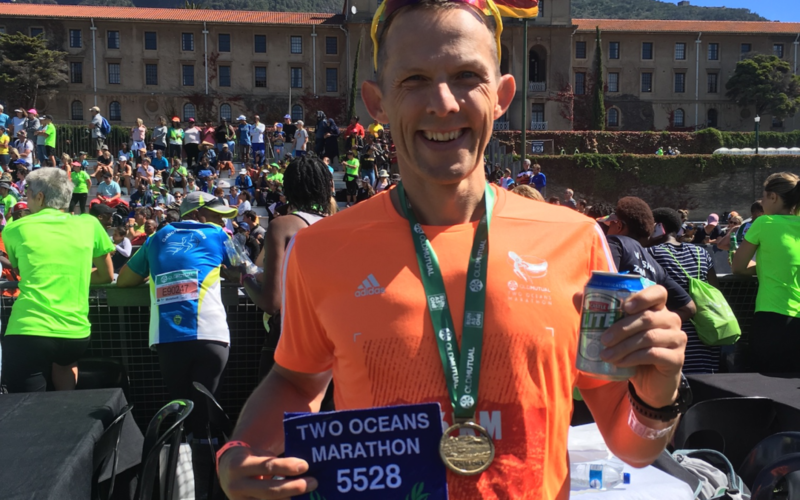 Congrats to all who took part in the 2018 Two Oceans Marathon. Thanks to Dieter for sending me the following message. 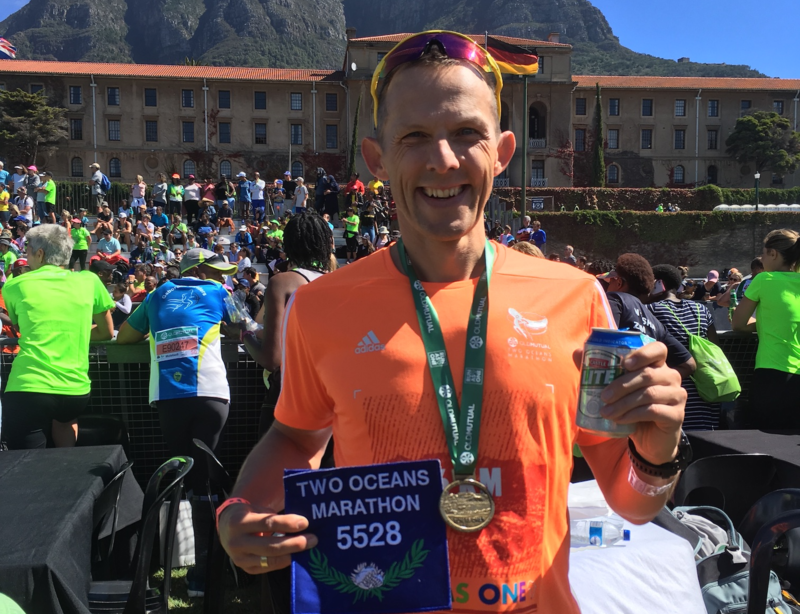 He used my Two Oceans Ultra Martathon Sub 6h strategy at his first OMTOM attempt – and managed to finish in 5h 48min. Congrats Dieter! Now 1 week of recovery followed by the preparation for my 6th Comrades Ultra Marathon on June 10th 2018. This year a down run, 90 km, and I want to get my second Bill Rowan medal this year (sub 9h) after managing to get my first Bill Rowan in 2015 in 8h 49min (up run).